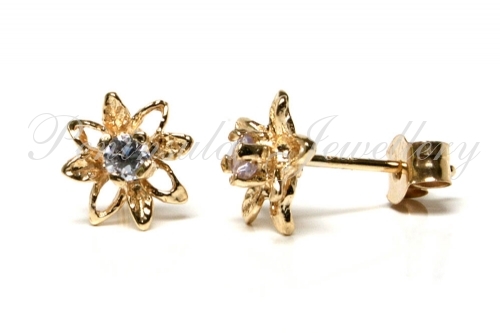 Pretty flower shaped studs in solid 9ct gold, each with a 2mm Lilac Cubic Zirconia gemstone in the centre. Dimensions: 7mm diameter. Standard posts and scroll fixings in solid 9ct gold. Made in England. Supplied in a luxury gift box – Great Gift! !